In my current reading list, I read Green Lantern: The End, which introduces new Muslim Green Lantern Simon Baz. It also is the very last story line that Geoff Johns wrote. Normally that is not a big deal if a comic leaves, since they change hands all the time, but Johns is special in that he took the Green Lantern comic and transformed it into a top tier franchise that inspired multiple comic book spin offs, a toy line, a cartoon show, and even a live action movie. 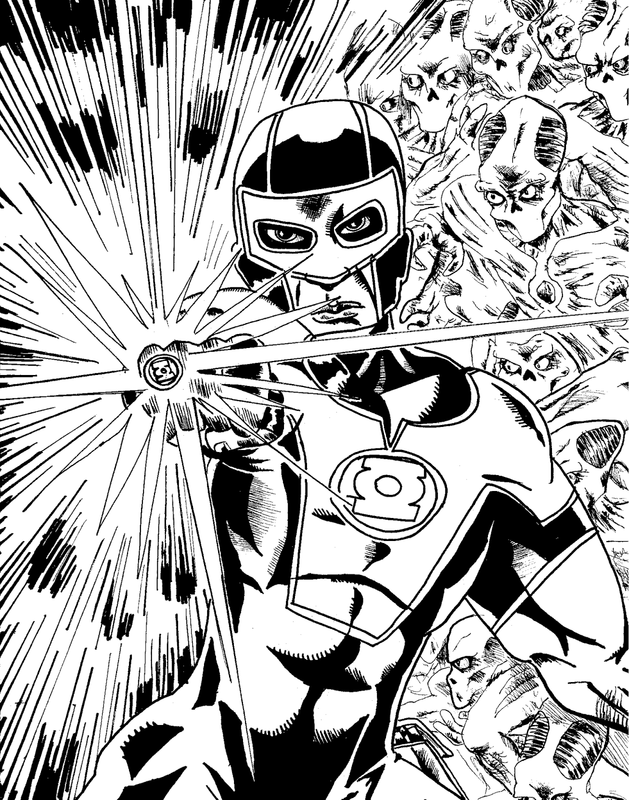 While I am a huge fan of Johns' Green Lantern run, Green Lantern: The End was really bogged down by stupid crossovers. So despite the fact that the hardcover collection supposedly has a complete story, it really only contains part of the story. If I wanted to read the rest of the story, then I need to get the other hardcover collections (which I am not interested in). I did like Simon Baz though. He is a good character on his own, but so far, no other comic has used him yet. That is a shame, because otherwise he is just going to fade into obscurity. I drew Simon Baz with a medium size Papermate Flair pen. The details and shading are drawn with a .01 and .03 cm width pen. The shiny light lines are drawn with a variety of pen sizes to make it look more frantic and random. It was also drawn with a Sharpie marker. Finally, those weird aliens in the background are the villainous Third Army. They are drawn with just a .01 cm pen to make them lighter and not have their details overwhelm Baz's figure in the foreground.